Do you have some leather belts hanging in your closet that are scratched, frayed, or just too small? Don't toss them! Transform them. At first, leather belts don’t seem like they would be much use to do-it-yourselfers. Then again, creative minds with handymen’s hands have found numerous ingenious uses for even less likely repurposing materials—used books, vintage dishes, and old luggage. 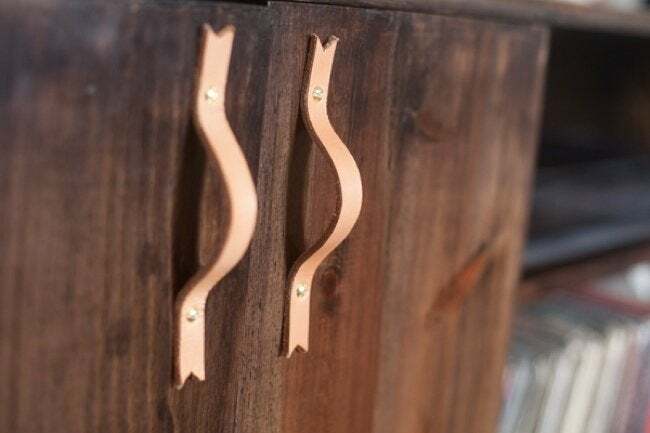 Strong yet flexible, easy to find and easy on the eyes, you can actually reuse leather belts in many of cool ways so that after they’ve gone out of style fashion-wise, they can still live for years longer in your home decor. 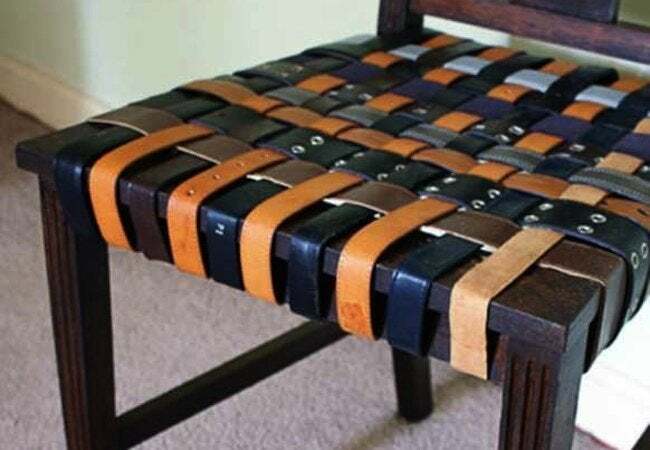 Reuse leather belts to make over a secondhand chair. Don’t worry if the belts you’ve collected are all different: Variety leads to a more striking design, so include as many colors and patterns as needed to cover the seat back and cushion areas. Rely on screws and washers work for attaching the leather to the chair frame. Looking for an out-of-the-ordinary update to your existing cabinet hardware? Reuse old leather belts to make “new” handles. First, cut the belt into strips of equal length. Next, poke holes in the belts that correspond to the holes on cabinet doors. Finally, drive screws through the holes, using hex nuts to fasten. The rich, earthy look of leather wonderfully complements wood flooring. 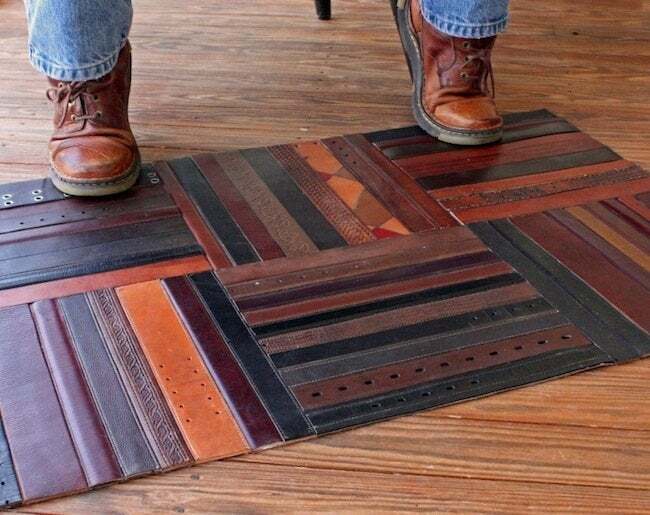 To make your own rug like this, start by designing your ideal arrangement on paper. Then proceed to cut the pieces needed and glue them down (with a strong water-based adhesive) to a sturdy backing. Almost too pretty to step on, right? 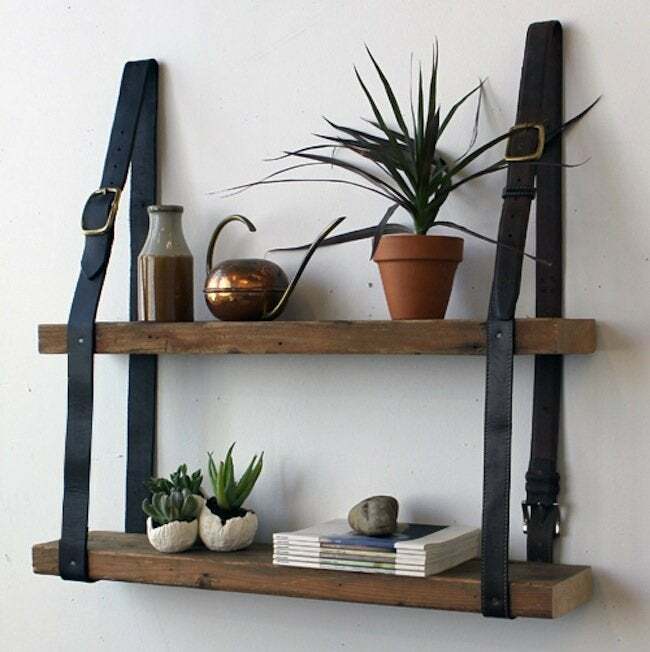 Check out this offbeat and folksy hanging shelf! It’s easy enough for even novice DIYers to reproduce, especially since so few tools and materials are involved. A couple of boards, a handful of nails, and either two or four leather belts—those are the only essentials in building an open display for all your knick-knacks. 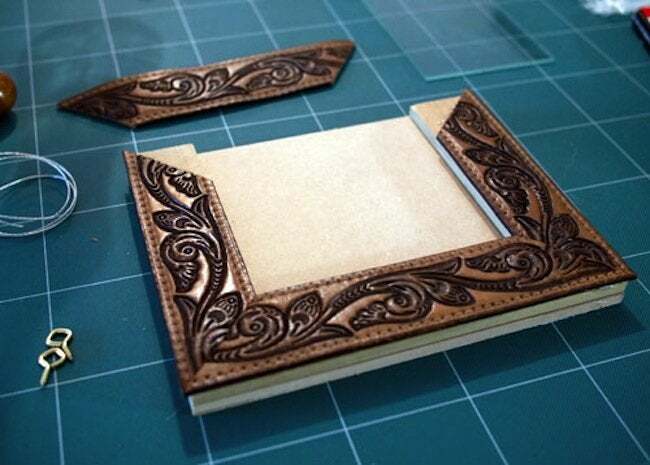 Yet another way to reuse leather belts is as trim for a picture frame. Cut four strips of equal length and after mitering their corners, glue them onto the face of an existing frame or of one you’ve built from scratch. Let enough material obscure the picture area so that you can fit a pane of glass or plexiglass under the edges.